How to batch download Acorn TV Videos for watching outside US? Batch download HD videos from Acorn TV as well as YouTube, Pluzz Francetv, UKTV Play, Pac-12, VH1, 9Jumpin, SBS, BBC, Medici TV, LAOLA1.TV, etc. All the world class mysteries, dramas, and comedies from acorn.tv are only available for streaming. In addition, Acorn TV is geoblocked outside US and Canada. Have you thought about downloading Acorn Videos for viewing offline? Is it possible to download videos from acorn.tv for watching in Australia, France or elsewhere abroad? Here, we will introduce an all-in-one Acorn TV Video Downloader and converter - Bigasoft Video Downloader Pro. Please follow this step-by-step guide to batch download Acorn TV HD Videos in one click. Free download the ideal Acorn TV Downloader - Bigasoft Video Downloader Pro, install and launch it. There are two different versions for Windows and Mac users separately. By using Bigasoft Video Downloader Pro, you will be able to unblock and watch Acorn TV anywhere and no longer have to be connected to the internet. Download videos from Acorn TV as well as YouTube, Pluzz Francetv, UKTV Play, Pac-12, VH1, 9Jumpin, SBS, BBC, Medici TV, LAOLA1.TV, etc. More than 1000 sites are supported. Batch download HD TV shows, dramas, and comedies at up to 10X faster downloading speed. Download and convert Acorn TV videos to any format for your player, such as MP4, AVI, MOV, MKV, WTV, WMV and more. Extract or rip audio from online video or local video and save to MP3, M4A, AAC, AC3, WAV, WMA, etc. Download videos to unblock Acorn TV and watch downloaded shows outside US. Easy to capture live streaming events and save in MP4 format with build-in video recorder. Go to the acorn.tv video page and copy the URL of the video you wish to download. Then paste the copied URL of Acorn TV video to the URL box on the main interface of Bigasoft Video Downloader Pro. 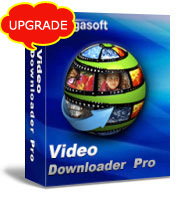 Bigasoft Video Downloader Pro downloads videos in its original format to keep the best quality. If you prefer to download and convert Acorn TV videos to your desired format, click the small triangle to the right of the "Automatically Convert to" and choose your desired format from the drop-down profile menu. Click the "Download" button to start the downloading from acorn.tv. After it is completed, right-click the item in Activity panel and choose "Locate Downloaded File" to get the downloaded Acorn TV videos. Besides acting as an ideal Acorn TV Video Downloader and Converter, Bigasoft Video Downloader Pro is also a video editor. It is easy to cut or trim downloaded video to remove unwanted parts, increase or decrease audio volume, merge and convert F4F or F4M files to MP4. Download and enjoy Bigasoft Video Downloader now.